Welcome to December’s first round of Life List Friday! Today, I’m thrilled to be hosting Gary Gauthier. The “slow but steady” writing approach that Gary discusses below is definitely appealing to me, as I’m sure it will be to other busy writers! Gary and I were both inspired by classic stories this time around, although he looked to a fable while I went to a fairy tale. After you’ve checked out Gary’s approach to winning the race, please hop on over to Marcia Richards’ place and kiss a few frogs with me – then just keep on hopping through our Life List blogrolls. Congratulations to all my friends who participated in NaNoWriMo. For those who didn’t make the finish line, take heart. It’s not every time we get to accomplish what we set out to do. Sometimes, life gets in the way. I was excited about participating for my first time in the annual novel-writing marathon. I prepared for it by making a decent outline of what I wanted to write but didn’t get to use it. Other commitments got in the way. A few days before November 1st came around, I decided I wasn’t going to participate this year. The dedication of time required was too much for me. NaNo will have to wait for next year. So what did I do with all the free time this past month? As it turns out, there was very little free time because I was immersed in another project that I gave a higher priority. 500, Sure and Steady, Is a Winning Strategy. Many of us have had the experience of repeatedly running into the thing that is upper-most in our mind. You want a cashmere sweater and all of a sudden there are ads for cashmere sweaters all over the place, and then your best friend shows up wearing a cashmere sweater. You plan on leasing a particular car and every time you’re on the road you keep seeing the same make and model. It must have been a similar synchronicity that made me run into an article about the writing routines of famous novelists. The one that works for me is the simple goal of writing 500 words a day. At first, I wanted to verify whether this system was a benign rumor, a myth or an urban legend. After some search-engine research, I came up with the names of two authors (according to unnamed sources) that wrote 500 words a day: Graham Greene and Ernest Hemingway. In their own way, each one is an accomplished novelist. I hear there may be others who wrote in a similar fashion. Whether their use of this system is myth or fiction doesn’t really matter if you can use it to stay focused and motivated. The second question that came to mind was: how long would it take to write a novel using this system? Most novels written for adults are between 75 and 100 thousand words in length. At this point, I had to resort to a calculator. 100,000 words divided by 500 per day gives you 200 days. At this same rate, you can complete a 75,000-word novel in five months. (150 days x 500 words = 75,000) After doing these calculations, it occurred to me that writing a novel is a much more manageable undertaking than the vague notions I had previously entertained. The Goal Is a Finished Product. After implementing the system and sticking to approximately 500 words a day, I find myself spending extra time crafting my prose to my liking. In the end, the completed manuscript will be a much better first draft than if I try to write as much as possible during individual sittings. How you define the “finished product” is up to you, but a decent first draft is a tremendous milestone and, in itself, a notable accomplishment. The Race Doesn’t Necessarily Belong to the Swift. If you consider that the vast majority of great novelists did not have the benefit of laptops with word-processors, (not to mention specialized software for organizing manuscripts) it’s easier to accept the supposition that these authors limited their writing to a few hundred words a day. It’s quite a job to manipulate large amounts of hand-written or type-written text. Every student who has written a five-page paper is acquainted with what’s involved. If sometimes you get overwhelmed by the enormity of your project and seem to be drifting without direction, remember: 500, sure and steady, is a winning strategy. So there you have it, I didn’t start NaNo, let alone finish. I don’t feel bad because, during the month otherwise dedicated to the event, I was engaged and productive. 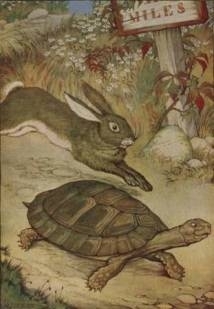 I also verified, to my satisfaction, a simple pacing strategy that reinforces the moral of one of Aesop’s fables. Did you participate in NaNoWrimo this year? What was your experience like? Gary is working on his first novel, a crime thriller set in New Orleans just before Hurricane Katrina’s landfall. His blog, Literary Snippets, gives him an opportunity to express and share his appreciation for art and literature. He occasionally posts articles as well. Some of his favorite writers are Thomas Hardy, Charles Dickens, George Eliot, Nathaniel Hawthorne and Edgar Allan Poe. But this changes from time to time. Stay tuned! Follow him on Twitter and Google Plus. This entry was posted in Creativity, Goal-Setting, The Life List Club, Writing, Writing A Novel and tagged 500 words a day, Aesop's Fables, creativity, Gary Gauthier, goal-setting, guest posts, NaNoWriMo, The Life List Club, writing, writing a novel, writing goals. Bookmark the permalink. Gary, I think you’ve hit an important nail on the head. I sometimes get so overwhelmed by friends who write 2,000 to 4,000 words a day that I want to give up. 500 words a day will get you there with a better product – and possibly even sooner – than a larger output on a sporadic basis. You’ve made me feel better about not participating in NaNo or ROW, etc. I totally agree, David! Reading Gary’s thoughts on reassured me that writing in smaller, steadier increments is a valid approach. As a writer w/ a full-time job, trying to write 2,000 or more words a day would probably lead to a lot of “not my best” writing for me, which then means spending more time cleaning up my mess : ). Pam, a full-time job sure can get in the way. I guess we’d all like to get to the point where writing IS our full-time job. At that point, maybe I’d bump myself up to 750 words a day. That’s the dream that gets me out of bed in the morning : )! Thanks for visiting, David. I’m glad I made you feel better about not participating in NaNo. But don’t give up! Never mind the folks who can pull 4,000 words in one day. Gary, I didn’t to the November challenge because I was finishing up a memoir. Now I have to go back and start it (long story). You have some wise words to all of us embarking on the serious business of creating a “good” first draft. Not rushing it (manageable chunks) and having steady progress are keys worth remembering. Thanks! Hi Lorna, I hope your memoir is coming along as you planned. It sounds like you’re going to take on the NaNo challenge on your own terms. Good for you! I agree, too. I set a bottom line and, when time allows, I challenge myself to beat it. 500 words a day is reasonable, especially if you’ve plotted your path. I’m unable to write everyday, so mine is normally a weekly goal and it works great. Even a monthly goal, which I’m using for December only, works for me. This month I want to write 25,000 words to complete a project. 25,000 divided by 31 days is about 800 words a day. Pretty reasonable but, I know there are 7 days I won’t be able to write, so I’m projecting 1,040 words on each of 24 days. For me, a realistic plan and a flexible goal works well. Seeing others writing 4 or 5,000 words a day doesn’t make me feel badly, it makes me happy-with my own goals. I know I’ve written to my goal number and I also had time to exercise, take care of chores, spend time with my husband and read, too. Great post, Gary! Hi Marcia, I’m with you as far as being unable to write every day. Sometimes, life gets in the way. But as long as you have a strategy and stick to it, you’ll finish the job. Good luck with your project! Great post. I’m having trouble switching from the query process back to writing my new WIP. and the slow and steady approach is a big help. It can be overwhelming to hear about those writing a ton of words a day, but it’s important to remember we’re all different and need to find what works for us. Hi Stacy, I always have trouble switching gears and getting started with a new project. This is where I tend to procrastinate. And we would all be better off paying less attention to the “ton of words a day” stories. Jen, Congratulations on finishing NaNo. Some of us need a strategy, others just go out and do it. Good for you!! This is the exact approach I did last year and was really successful with it. Knowing how much was on my plate I wished I’d gone this route again this year. I can do 1,000 words a day with focus, but the nano necessary 1667 was sometimes a big stretch. I think my goals for writing are in need of revision. I like your plan. I’m glad you can relate, Jess. Being able to pull off big numbers in a short time period sounds attractive, but it has to be able to fit into your lifestyle. If a strategy has worked for you in the past, don’t fix what ain’t broke. Gary, I’m all about the timed approach. The page goal approach usually lets me slide too much because some days I really crank and other days, not so much. I’m a faster writer when I take the pressure of word goals off and do a timed goal. Blogging has really helped as a warm-up tool for me. If I write for 2 hours about 5 days a week, I usually end up with a 2-3 page blog and about the same amount in my WIP. 10-15 pages per week is better than nothing and lets me finish a book or two a year while raising my daughter, working part time, and building a writing platform. I’m OK with that. Thanks for sharing Jenny. Sounds like you have your hands full and writing is a big part of your life. I wish writing were a bigger part of my life, but for now it only plays the modest role of a hobby. A book or two a year sounds really good to me considering I have yet to pull off my first novel. I’m with you Gary – its a hobby I take very seriously, but certainly not one I can devote enough time to to consider it more than that, as much as I’d love it. One day, if we keep at it, we’ll be there too! With the blur of NaNo over (and, no, I didn’t quite make it, about 6k below the goal), I’ve been doing a lot of thinking about my goals, so this post came at a great time and really got the wheels in my head turning. I love the suggestion here of 500 a day, slow and steady, and especially the idea that after those 500, there’s still more work to do (if you have time). Because I know one thing for sure: my NaNo piece is a mess. It’s just a big pile of words without nearly as much structure or skill as I would like. I’m realigning my goals and have considering doing 500 words a day on the three WIPs I’m typing at the moment, and figured if I got more done, even better. But this post has inspired me to focus on hitting those 500 words (well, technically 1500 since there are three of them!) and then use any time I may (ha ha right!) have left to refine what’s already been written. One of the projects is new so I don’t know how it’ll work for that one, but it sounds like a great idea for the two that have a lot of words already in need of some editing. I’m really eager to see how this approach works out for me. Thank you so much for the post and for inspiring yet another fresh take on my writing, Gary! LS, Thanks for visiting. 44k words is a big success as far as I’m concerned, so congratulations to you. I’m glad you got some insights from the blog post. I am really envious of folks who are able to devote a great deal of time to writing. All creative work takes a great deal of time and those who have the time definitely have an advantage. Three WIP’s to work on is definitely a full-time job as far as I’m concerned! I’m definitely trying to treat my writing more like a full-time job lately, so it’s good to hear that I’m on the right track! I’m blessed to have a technically part time job (about 35 hours a week) that gives me more flexibility to focus on my writing. I’m not making a lot of money right now or anything, but I get to pursue what I love, so I can’t complain too much! That’s exactly where I’m trying to get : ). I try to treat my writing like a part-time job right now. Am usually good at it, but sometimes when the “mean job” takes too much time I play hooky. I think a “little bit at a time” approach will help get me out of that habit! This comment really made me think. I thought my decision to do NaNo was based on the realities of my time constraints, and much of it was. But the other part is that I KNOW I’m a bad editor. If I’d done NaNo, I’d have a LOT of hastily written work to go back and edit, and I do so much better if it is in pretty good shape the first time, even if that means it comes together much more slowly. I can edit a good piece and make it better, but having to plow through a whole novel that probably needed a lot of reworking would be more overwhelming to me than starting from scratch : )! Congrats on such an awesome accomplishment though. With time and the ability to put the pieces aside for a while and come back to them (slow and steady), I’ll bet you’ll find you’ve got a diamond waiting for some polishing! This is absolutely fantastic! I didn’t think about how much 500 words a day could really do. That’s definitely doable. I for one can say that you have NOT bored me to tears, Aurora – I always find something new and refreshing to read and think about when I visit your blog! Hi Gary. Enjoyed the post! I did NaNoWriMo this year for the first time and made my 50 K words in time; however, my novel is far from finished. I believe in writing a little every day, and contrary to the tons of advice I’ve received, I like to edit as I go. That’s why around 500 words per day would work perfectly for me. Thanks for the thought-provoking ideas! I did NaNo and finished but I wasn’t happy with the “quantity over quality” aspect. 500 words a day makes so much more sense. I’m happy I did it, though. I’m no longer talking about writing a novel, I’m actually doing it. I wonder sometimes if word processors are a help or a hindrance.. It sure is easy to charge ahead before taking time to pause and consider. If it wasn’t for carpal tunnel, I’d write longhand, just to see how my writing changed. I know exactly what you mean, although I find I really get stuck when I try to write longhand now. Keyboard clicking seems to have become wired into my writing process! This is essentially the technique I eventually hit on. I do most of my writing on the train commuting home in the evening. I found I could comfortably write 500 words in the time I had with some time left for editing and generally thinking. I tend not to write at weekends. It’s not long before the draft takes shape this way and it is less stressful.